The Federal Reserve Bank of Richmond is one of 12 regional Federal Reserve Banks that make up the U.S. central banking system. 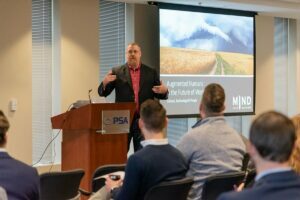 Mind Over Machines has enjoyed a close working relationship with the Richmond Fed’s Baltimore branch since our CEO Tom Loveland took on Maryland’s “tech tax” in 2007. Over the years, the Bank has come to count on our MINDs for a holistic view of tech in business and culture. The Waterfront Tech Series soared into its second season with Episode 5: Higher Tech, Higher Ed. This time, the quarterly learning and networking event examined how technology is being used to develop and retain talent at all levels. Whether you are preparing students for college or graduates for the workforce, tech plays a vital role in getting people ready for what comes next.